An election is one element of a democracy. It has to be free, fair, and transparent. How elected representatives and citizens receive it is just as critically significant. But it’s the daily work of nurturing civil society and sustaining democracy that also matters. Elected representatives often follow. They take their cue from us. Educators, classrooms, and schools play unique and important roles in democracies and in nurturing civil society. This post-election period offers an opportunity to engage students as civic actors, thinkers, and problem-solvers. In thinking about the next few days, weeks and months, we might take inspiration from some divided societies and fragile democracies around the world. Admit there is a problem. I’m not being glib. One of the differences I experience in working in divided societies or those emerging from mass violence or transitioning to democracy is that the people know it. The iceberg diagram is useful here. The tip of the iceberg is where we are now, but the body of it, the iceberg itself, is everything below. Begin to create one. Let’s look at ourselves and figure out what is below the surface. Explore transitional justice tools. Many divided societies emerging from mass violence use these. They range from historical inquiries to truth commissions to reconciliation initiatives to educational reforms, among other things. Looking at another place can give us the distance we need to consider our own country and communities. It might even remind us of things that exist in the US or happened here in the past that need to be re-awakened or repurposed. There are churches in Northern Ireland that host cross-communal discussions. South Africa’s truth and reconciliation commission was a nationally sanctioned official effort that had many goals, but one was acknowledgment. This is different than knowledge about what happened. The processes of recognition include listening to multiple points of view, creating a respectful environment for engaging them, and a facilitated process. Many of their observers have said there is sometimes too much storytelling and not enough listening. Cross borders and facilitate border crossing. Divided societies that are aware of identity-based separation often have cross-communal projects. These include sporting activities and shared education programs. Look around: Is your community representative of the diversity of your town, city, state, country? What border crossing can you facilitate or participate in? Look up, listen, and unplug. Help young people (and, frankly, all of us) make eye contact and engage in discussion with other people. Help them recognize that our devices can get in the way of respectful human connection. What are their solutions? Be creative. It’s times when we are anxious or feeling insecure that we get the most stuck and turn to patterns, even those that don’t work. One effect of diversity is greater creativity--different people bring different points of view and experiences. Being creative can also mean using other mediums and methods—poets, playwrights, and artists of all kinds could be sources of inspiration and reflection right now. False unity and fake history are temporary fixes. Some countries create official narratives to promote unity. Critical thinkers see beyond these constructions. Moments of sharedness and authentic engagement might be small but they are real and provide steps to build upon. Develop tolerance. This is in the sense of Jacob Bronowski, the kind of tolerance that eschews certainty, rejects dogma, and embraces the idea of touching people, being empathic and sensitive and willing to believe that you could be wrong and that another point of view is valid. It’s seeking a human connection. Develop intolerance. The ability to say, "Enough already." Ongoing exposure to hatred and violence and separation by identity are toxic. This means civil behavior, kindness, respect, not saying or doing whatever we want because we can. What would this mean for your classroom? School? For your students themselves in their communities and with their friends? What does “there” look like? What do you aspire to? Part of a successful transition to democracy is considering where you’ve been, where you are, and where you are going. This does not mean that people agree or that there’s full consensus. It means we can sit in a room together and engage in discussion and work on something shared in light of our differences. Resilience. Marshall Duke, a professor at Emory University, found that young people are more able to withstand stress and challenges when they knew more about their family history. His research showed that it was about being part of something larger. He also found that the kinds of stories parents told matter. There were ascending narratives, descending narratives, and oscillating narratives. The latter is most effective—it’s basically about managing ups and downs, about failing or struggling, and figuring out what to do about it. Parents can apply the lessons from this research, so can educators, school leaders, community members, and national leaders. Media literacy. Americans are often critical of people from other countries for not knowing what was happening when something terrible was going on—apartheid, genocide, ethnic cleansing. I have had the privilege of meeting many people who did know, and it required them to seek out alternative forms of information because they recognized the limits of their media. Yes, journalists, editors, and publishers have particular responsibilities in a democracy, but given the power of social media and the abundance of information, we have to take more responsibility. Students are often ahead of adults in terms of their social media use. What media literacy programs can they design? What basic media literacy can you re-introduce in your lessons so that it becomes a taken-for-granted practice? Keep going at it. Six months from now, a year from now, two years from now—when the election feels far away and day-to-day life kicks in—take the temperature of your community, society, country, and your classroom. Bring your students in on that process. Too many societies do the hard work in the immediate wake of their political negotiation and then…they get to “normal.” Maybe we have to change our thinking about what constitutes normal for multicultural, multiracial, dynamic societies that continue to face the legacies of the past. Each generation has to do this work. It’s not a one off. Practice negotiation and compromise. They’ve become dirty words, evidence of “selling out.” They are actually the work of democracy. Zero-sum political environments often come from zero-sum societies. The US is not alone. Other societies have gone through a difficult election. For the US, this past election shows the fissures in society and seems to fundamentally question who Americans are, who they want to be, and how they want to live. France, the United Kingdom, Colombia, and South Africa are just a few of many places that are also confronting these questions. Looking inside ourselves is critically important, but that’s different than becoming insular. Engage students in an exploration of other places right now. What patterns does this suggest globally? Finally, consider this. Scholar Carol Gilligan has talked about the complexity of human relationships, that all relationships suffer ruptures. What’s important, she says, is the quality of repair. 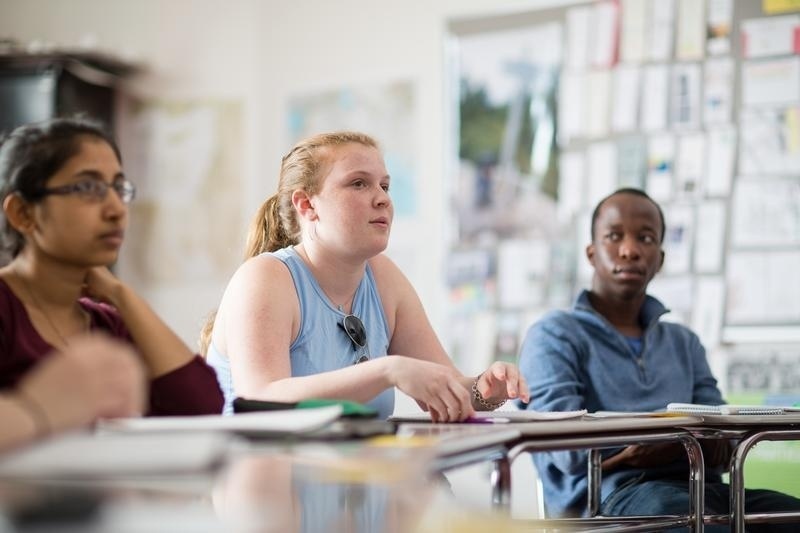 Explore our guide, "Fostering Civil Discourse: A Guide for Classroom Conversations," to discover teaching strategies that can help you have meaningful and productive conversations about the election.